Welcome to the official website of the 24th Symposium of the Hellenic Nuclear Physics Society. This year, the Symposium is organized by the Department of Physics of the University of Ioannina. The Symposium will take place on Friday 22th & Saturday 23st of May 2015. The final version of the HNPS2015 Proceedings Volums is now available for download. In preparation of the HNPS2015 Proceedings Volume, all contributors are requested to submit their paper using our online submission system. The deadline is April 15th, 2016. No further deadline will be given. The final program and the Book of Abstracts are now available online. 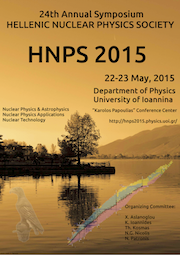 This is a reminder that the deadline for registration and submission of abstracts for the 2015 Symposium of the Hellenic Nuclear Physics Society, is on Friday May 8, 2015. We are pleased to announce that Dr. Franz Käppeler from the Karlsruhe Institute of Technology accepted to give a plenary talk in our conference. This is the second circular for the 24th Symposium of the Hellenic Nuclear Physics society, which will take place at the conference center “Carolos Papoulias” of the University of Ioannina, 22 and 23 May 2015. As always, the scientific program will cover all the aspects of Experimental and Theoretical Nuclear Physics, Applications and Nuclear Technology. A web site has been activated at http://hnps2015.physics.uoi.gr from which you can register, upload abstracts and find all the information about the Symposium. The site will be enriched with all the relevant information, on our way to the Symposium. The dead line for registration and submission of abstracts is Friday May 8th 2015. The abstracts should be structured according to the template. Due to the well known financial difficulties, there will be a conference fee of €20 for the senior members of the Society and €10 for the postgraduate students and postdoctoral researchers, to cover part of the expenses. Arrangements have been made for a limited number of low cost rooms at the University guest house (for postgraduate students). Students, who are interested, should apply during their registration, in the field "comments". We hope to see all of you at Ioannina and have a fruitful meeting.